Pug puppies make wonderful pets. Pugs are very affectionate and loyal, and are happy to curl up at your feet. If you’re looking for pug puppies for sale, you can be sure of a loving companion. Pug puppies are playful with children, they get along well with other household pets and they train quite well. Pug puppies are intelligent, but are also sensitive, so that training needs to be done with gentleness. Pug puppies are believed to be from China. Perhaps a relation to Tibetan Mastiffs, brought to Holland first and then to Britain in the 1500’s-1700’s. In fact, legend has it that the pug was a prized possession of the Emperor of China. They are generally silver and black in color, with a black mask. Pictures of pug puppies show the beautiful blend of black through the silver, especially down their back, which are most characteristics of pug puppies. 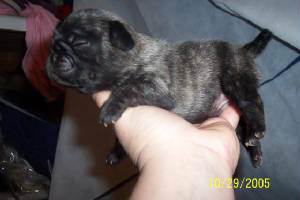 Pugs also come in fawn, apricot-fawn, silver, black and NOW brindle. Pug puppies belong in the “TOY” group category because of there size, growing to be about 10 inches tall and 15 pounds in weight. They generally need more exercise than other small dogs. Pug puppies adjust well to living in an apartment, as long as they’re allowed regular walks outside for exercise fresh air and stimulation. Pug puppies make a noise resembling a pig, and they’ve been known to snore. There short wrinkled nose and stocky little body make them a very recognizable breed. The work “PUG” actually means “closed fisted” or “clenched fist” and refers to the tightened, drawn in face of a pug, kind of like a closed fist. Whatever the description all pug owners know that these dogs are loyal and true. Pug puppies are small and compact but full of fun and energy.